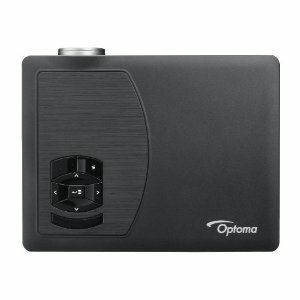 The Optoma ML500 is a fantastic unit and a great example of where things are going in the world of mini projectors. If you're after a best of breed mini projector, this is the unit for you. It's a sophisticated unit with lots of features and great projection quality. It gets a massive thumbs up from us. While the Optoma ML500 is a little heavier than most of it’s mini projector brethren, if you’re after high quality, impeccable picture, and brightness that will knock your socks off then you simply can’t surpass it. Optoma have taken the other end of the market and quite by surprise I would think too. Mini projectors often get a bad wrap for having less than desirable picture quality in varying light conditions. This arises from the usually low lumen levels. Not so with the Optoma ML500. It’s called the ML500 I’m assuming because of it’s unheard of 500 lumens. This is truly a best-of-class projection unit. Have you wanted to project your movies in a big screen like manner with a little mini projector unit and been slightly disappointed with the results? Well not anymore. The Optoma ML500 wipes the floor with it’s competitors. You can project truly excellent quality 180″ (~4.57m) images across any surface. It has an amazing contrast ratio of 3000:1 thanks to DLP technology. It’s LED driven and has a lifetime of around 20,000 hours. That translates to no bulb changes necessary over it’s lifetime. In our review of the AAXA M2 mini projector just a couple of weeks ago I noted that my favourite feature was it’s 1GB of onboard memory. Well, strike that from the record folks, because the ML500 has a humongous 2GB of on board memory. Making for easy playback of movies, slideshows, presentations. Just about any type of media you can think of. You can plug and play with SD cards up to 32GB. There’s also USB for direct access via laptop. Connectivity extends even further with VGA and HDMI inputs allowing you to connect your laptop directly, or even a bluray player, HD video camera, gaming console, and more. Although we thinks that sitting at 2.5 pounds (~1.13kg) is a little hefty for a mini projector we think that professionals will still travel with this projector given it’s feature set and best of class projection technology. One explanation for the weight is that the power supply is embedded inside the unit (quite unusual for mini projectors). This means that you just need a regular PC power cord for power which is pretty cool. I bet their marketing team wasn’t too happy though. Most projectors have a power brick unit sitting outside meaning they get to say that the unit weights next to nothing. 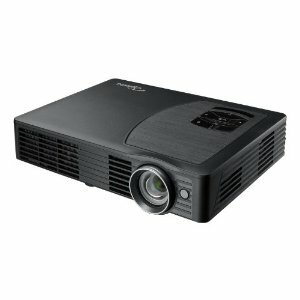 It really shines though as a portable cinema projector with the full range of media options and connectivity being super handy in this instance. The Optoma ML500 uses latest generation LED driven DLP projection technology for super crispy imagery and large projection size. At over 20,000 hour rating for the LED light source you can run this unit for 4 hours a day for 13 years before burnout. That’s incredible. It’s also much more cost effective from a power stand point. We love that mini projector technology in these high end mini projectors is moving towards being a self contained projection unit with on board storage and it’s own MP4 type player software. It’s a really smart amalgamation of technology and a sure way to ensure the continued existence of mini projectors. 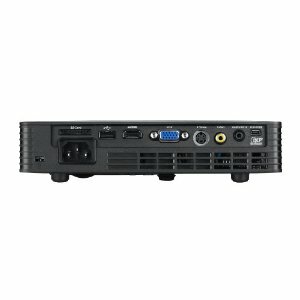 The Optoma ML500 won’t be for everyone, but for those looking for best of class technology or looking to replace their old projector unit with something more modern and sophisticated then this is the unit for you.